About Pfizer Pfizer makes a very real difference in hundreds of millions of lives every day. As one of the largest pharmaceutical corporations in the world, its wide-ranging portfolio consists of medicines, vaccines, and consumer healthcare products. For example, Lyrica, Zoloft, Celebrex, Prevnar 13, EpiPen, Advil, and Centrum are all from Pfizer. Pfizer’s success is largely built on breakthroughs discovered through rigorous experiments and studies at its nine research and development facilities. Scientists there are always aiming to refine their methods to do the job better. 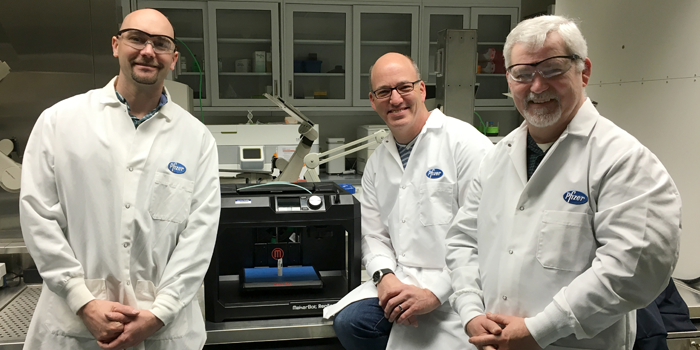 For developing osteo and rheumatoid-arthritis treatments, scientists at Pfizer’s Global Research and Development headquarters in Groton, Connecticut are streamlining their research with MakerBot®. Through 3D printing, Pfizer is accelerating innovation and retaining a competitive edge in the market—all with a proven ROI to show for it. Developing Osteo and Rheumatoid Arthritis Drugs Comparative Medicine Department Scientists David Zakur and Edwin Berryman test preclinical arthritis treatments with a Micro CT Scanner. This scanner allows them to take high-resolution 3D images of bone samples, primarily in the rat species. Arthritis is a disease of the joint, primarily affecting the cartilage and underlying bone. For these studies, a 1.5 cm long sample is used from the proximal tibia; one of the bones that comprises the knee joint in both rats and humans. The sample is shaped like a keel of a canoe. Their goal is to study the articular cartilage and underlying bone of the joint. By examining the cartilage at a high resolution of 10 micrometers, they can compare the effects of an experimental treatment in one set of samples against samples for control groups and for existing arthritis treatments. The scanning process is laborious. A preliminary scout image is taken at a low-resolution to make sure the sample is oriented correctly, which is critical. The sample is then scanned at high-resolution, then soaked in the contrast agent Hexabrix, then scanned again at high-res. The first scan allows them to collect and compile bone data while the dye and second scan are for examining cartilage. Zakur explains the process with, “We also need bone data and the before image gives crisper resolution for those images due to the nonspecific ‘glow’ created with the contrast soaked bone… we always look to publish our data, and before and after images help to tell the story with cartilage imaging.” ￼￼ Challenge For each scan, the sample needs to be in the exact same position; otherwise, the image data are unusable. To develop new, effective treatments that can compete in the market, they need to ensure their testing methods are innovative. Since this test is so specific, a holder for these specific rat bone samples didn’t exist. Outsourcing one iteration could cost two to three thousand dollars. Since their budget was limited, the scientists initially fashioned their own holder in the lab from conical tube and transfer pipette. That holder and the sample would then go into the scanning tube that fit inside a carousel within the scanner. The holder had a 40% failure rate, which required them to re-scan images often, resulting in wasted time and plenty of frustration. To conduct this test, they needed an efficient, reliable solution with a 100% success rate. Solution The answer was in the Developmental and Reproductive Toxicology Lab with scientist Tim Winton. Knowing that he worked on projects with a MakerBot Replicator® Desktop 3D Printer, Zakur and Berryman asked if Winton could design and 3D print a bone holder. Winton quickly learned that there are “no flat bones”. Therefore his first challenge was to design a holder that could both hold the bone at the correct orientation and accommodate all bone samples, which differ slightly from animal to animal. To add to the challenge, samples placed in Hexabrix cannot dry out. If they do, the image will be unusable because the cartilage cannot be “seen” by the scanner. To maintain the necessary humidity, a small amount of saline solution is added to the tube that fits inside the scanner. Winton needed to design a holder that was dense enough so that it wouldn’t float; it also couldn’t be metal, since these scans are X-rays. After ten iterations using AutoDesk 123D Design software and his MakerBot 3D printer, he got it. Fast and consistent prints during the prototype phase is key. According to Winton, “This consistency is imperative during the design process, when subtle tweaks to the holders were made in order to deliver the final product. Once the final design was complete we needed to print numerous holders. The Replicator’s consistency was showcased again by delivering exact duplications of the holders from print to print. Most notably the notches within the holder where the bone is placed are needed to be exact and replicable amongst all of the stands, and the Replicator provided excellent results.” Benefits The new holder allowed Zakur and Berryman to streamline the entire process of scanning samples and organizing the images. In their initial workflow, they had to set up and position samples in holders, run scout images and scans, unload and reposition the samples that didn’t scan correctly, replace them in the scanning chamber, then go through the scout and scanning process again. Constant scanning and rescanning required them to spend exorbitant amounts of time combing through 500 images to find 100 that were useable. The new holder reduced scanning time by an hour, which also translated to much less time selecting images afterwards. The scientists can find nearly identical geographic locations of the same bone samples through multiple scans and locate nearly identical anatomic structures between samples. With this efficient process, these holders have also allowed the scientists to save money by taking only the images they need. Also in terms of cost, one outsourced holder would cost two to three thousand dollars. Instead, Pfizer could iterate on a design and then create many holders at low cost, spending the same amount on a MakerBot 3D Printer and the $48 for a large spool of PLA filament. Spread across myriad studies, this small innovation has amounted to thousands of hours and tens of thousands of dollars saved. According to Robert Chapin, Senior Research Fellow in Developmental and Reproductive Toxicology, he originally brought in the MakerBot Replicator as an affordable entree into 3D printing. That entree payed off, sharing “3D printing allows everyone a greater degree of control and influence over their job, encouraging people to optimize the tools they use so that the job runs faster, smoother, and better.” With a reliable, easy-to-use MakerBot 3D printer, Pfizer’s scientists are empowered to test potentially breakthrough treatments that would not have been possible before.